Sunday evening July 16 Celian Adams fractured his hip. He celebrated his 86th birthday two days later by having 4 screws bolting his bones back together. It happened after he'd been on the roof of his metal shed, removing bee frames from hives he has up there to keep the bears from getting to them. He got off the roof just fine, and was headed into the house with a bucket of honey in one hand and some bee frames in the other. Somehow he tripped on the doorstep. Attempting to keep from spilling the honey bucket, he crashed hard on the concrete floor. The bucket stayed upright, but he couldn't get back up from the floor. He didn't realize he had a broken hip. It began to swell and the pain became more intense. 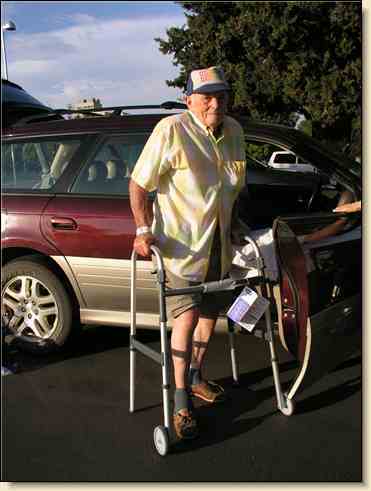 His wife Betty helped him onto the bed, using the old crutches from when he last broke his leg 42 years ago. He also broke the same leg in a motorcycle accident when he was a teenager. By 2:00 a.m. Celian's pain became too intense, and since Betty can't see to drive safely at night, he drove using his good foot to Mather Field V.A. Hospital in the valley about 1-1/2 hours away. When asked about his pain level in the emergency room, he said "It's a 20." "But the scale only goes from 1 to 10!" he was told. "Well, it's a good strong 10 then" he replied. "I've had broken bones before, and the pain was never this bad." He got painkiller right away. The X-rays revealed a fracture that needed to be repaired elsewhere. So he and his wife rode the ambulance to San Francisco. Celian enjoyed the ride very much - 3 attractive young female attendants made sure he was comfortable, holding his hand, stroking his head, rubbing his feet. And poor Betty was riding in front, unaware of what was going on behind her! Their daughter Linda flew up from southern California, rented a car, and has been making sure all the details are being taken care of properly. Celian got a room with an ocean view at Fort Miley V.A. Hospital in S.F. After further testing, he had surgery Tuesday afternoon, and began physical therapy the following day. He's in a lot of pain, but happy to have his wife & daughter with him. They are staying at a nearby inn. Celian may be there at least until the weekend, and we don't know when he'll be able to come home. It will be at least 6 weeks before he can walk on his right leg again. Betty told her husband, "Next time forget the honey and take care of your Honey instead!" So that's the news for now. We all canceled our plans to attend Redwood campmeeting as we do every year. We're keeping an eye on my parents' place & making sure the garden, chickens & cats are taken care of. We'd appreciate your prayers on Daddy's behalf.